Shoddy Leadership: 90% Of Leaders Are Average Or Worse – Why? We live in a world of shoddy workmanship. In 2012 there were more than 650 car safety recalls affecting over 17.8 million vehicles; that number rose to 22 million vehicles in 2013 and today it seems that the automotive industry is recalling cars faster than it is making them. This is just the tip of the shoddy workmanship iceberg. 1.2 million tires were recalled; 30,000 boxes of cereal – glass fragments; cycling helmets – head-injury risk; Christmas tree lights – fire hazard; beds – excessive lead levels in paint; cinnamon rolls – plastic pieces in the cinnamon rolls; 8 million toys recalled. The list of shoddy workmanship is almost endless. Most leaders do not strive to be mediocre or worse and most do not consider themselves as marginal yet for many leaders their followers claim otherwise. This is a huge blind spot. IV. Philosophy, Process, or Practice? Many people believe is a process or a series of practices. Leaders do these things, they believe, and their quest is to build a toolkit of leadership skills. While skills are important, this is not where leadership begins. Leadership is first a series of beliefs, a philosophy. Skills follow and are greatly influenced by what that philosophy is. Most leaders never spend any time seriously considering what they believe about people, work and the role of leadership and, as a result, they have no clearly articulated principles to guide them through difficult decisions. 1. The average person dislikes work and will avoid it if he/she can. 2. Therefore most people must be forced with the threat of punishment to work towards organizational objectives. 3. The average person prefers to be directed; to avoid responsibility; is relatively unambitious, and wants security above all else. This philosophy points to a leadership style that believes (or acts as if) people cannot be trusted to perform on their own. This requires the manager to constantly oversee effort and activity to ensure success. This leader feels he or she must control, direct and oversee the workplace to insure that results are produced on time, in sufficient quantity and to the quality level desired. 1. Effort in work is as natural as work and play. 2. People will apply self-control and self-direction in the pursuit of organizational objectives, without external control or the threat of punishment. 3. Commitment to objectives is a function of rewards associated with their achievement. 4. People usually accept and often seek responsibility. 5. The capacity to use a high degree of imagination, ingenuity and creativity in solving organizational problems is widely, not narrowly, distributed in the population. 6. In industry the intellectual potential of the average person is only partly utilized. If a leader truly believed this philosophy, he or she believes that people can and do excel at work. The leader would attempt to integrate and align efforts by practicing a more engaging, participative and collaborative style. A leader guided by Theory Y would work to build commitment by setting clear expectations as well as guiding, supporting and coaching talent to achieve those expectations and goals. Insight 1: Leadership is first and foremost a philosophy (set of beliefs), but those beliefs must be consistently put into practice. Consistency between words and practices is essential for great leadership. Unfortunately one of the greatest causes of poor leadership is leaders who talk the Theory Y talk but walk the Theory X path. The problem many people have with McGregor’s Theory X and Theory Y is that it lays out two prescriptive choices. It is not important that people accept one of McGregor’s theories as their own. What is important is that leaders answer two fundamental sets of questions that underlie McGregor’s work. Insight 2: Just as in Robert Frost’s poem, leaders must determine which road they will travel. Insight 3: If a leader does not believe that people and productivity mix, then that leader will never consistently practice high achieving leadership/management skills. Leadership starts in the mind – what leaders believe about people but it is followed by a question of the “will”. Do leaders have the will to practice what they say they believe? 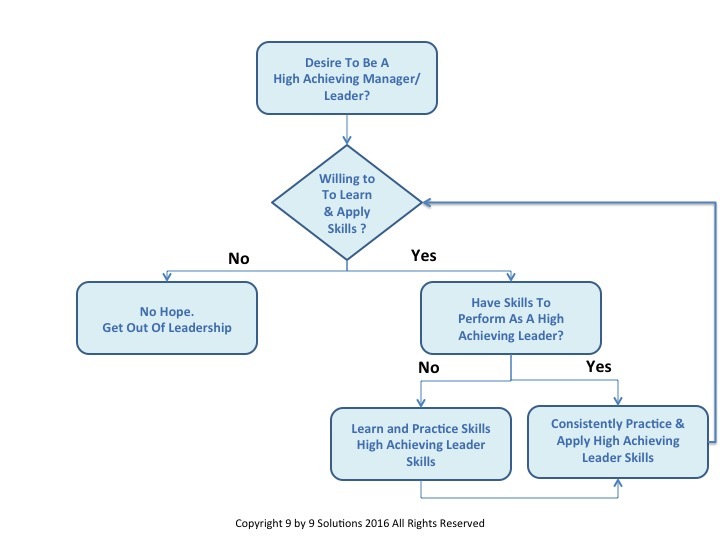 As the decision tree indicates, leaders must face the question, “do I want to be a high achieving leader – do I want to be great at this profession of leadership?’ If the answer to that question is “no”, that is honest but the leader should get out of leadership and not continue the shoddy workmanship for the many who will be impacted by the leader’s work. If the answer is yes, a second question, “ Do you have the skills to perform as a high achieving leader” must be answered. Will alone does not win the battle. It is the will to gain and use the required capabilities that counts. Most leaders cannot honestly answer this question by themselves because of personal blind spots. Most of us are superior performers in our own minds. Therefore, Feedback, advice and the counsel of trusted advisors are necessary to point out our strengths and weaknesses. Listening to this feedback can be very painful which is why the process requires will. Almost all leaders will discover they have gaps in their leadership capabilities and practices. Therefore the question becomes, “Am I willing to gain and practice those capabilities that I lack). If the answer is yes, then the development process begins until the skill is learned, routinely practiced and applied. 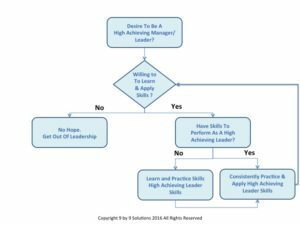 One will note that there is a line from high achieving leadership back to the core question, “Are you able to perform as a high achieving leader”. Leadership is a constant learning process, if not in the development of new principles and skills, then surely in learning to apply those principles to unique situations. Today most managers and leaders will say that people are important. It is politically incorrect to say otherwise and besides most leaders do believe in their head that most people are important. Most leaders are exposed to leadership training and the latest concepts. Leadership terms and slogans can be spouted with authority. “40 mile marches, point the way, situational leadership, servant leadership, right people on the bus, lead from the heart, people are my most important product, ad nauseam”. Therein lies a major problem. Instead of learning how to lead by learning skills, many leaders feel they learn to lead by learning new phrases. The latest and greatest is more important than the tries and true. (Of course the many charlatan leadership thought leaders who are trying to earn a buck off the leadership profession fuel this insanity.) Leaders adopt and discard these magic bullets without any behaviors to reinforce that they are genuinely understood or believed. Thus many leaders “talk the talk” without building any foundation that “walks the talk”. VIII. Then what is the problem? Too many leaders use Theory Y language but practice Theory X behaviors. This inconsistency does more damage than all other leadership failures. The gap between words and deeds speaks loudly. Managers do not understand why they are so loudly criticized when they have expressed verbally that people are important. Employees observe the gaps between the walk and the talk and they do not understand how a leader can speak one way and act so differently. Trust and respect deteriorate. Insight 4: Leaders are often like a barking dog with the wagging tail – employees often have to determine which end to believe! IX. What Can A Leader Do? 1. What do you believe about people and their role in producing significant results? 3. Are you willing to learn and consistently practice those behaviors? It always helps if the leader would sit down and write their leadership philosophy. This should not be written the way many organizations develop their statements of core values: by listing every positive value known to man. Instead write down what you really believe and see where the application of those beliefs points you. Let me know if you would like to see a copy of my leadership philosophy. Your “Leaders are often like a barking dog with the wagging tail – employees often have to determine which end to believe!” explains the main issue in today’s leaders culture. I know that shoddy leadership is very common. 1. The quality of the employer. 2. The quality of the HR leader. 3. The culture of the society. 4. Family and school education. 5. Copying previous leaders’ culture. 6. Weak learning and understanding capability. 8. Poor values and beliefs. 9. Poor personal integrity and credibility. 12. Poor capability to solve complex problems. Of course such leaders will damage their credibility, engagement and customer loyalty of the company in future.The result is failure of the business.